This filter reduces alias effects (see Antialiasing) using the Scale3X edge-extrapolation algorithm. 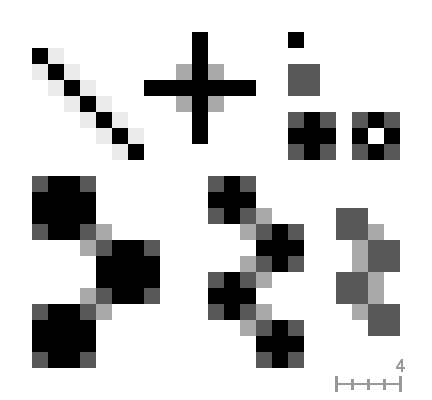 Scale3X is derived from Scale2X, which is a graphics effect to increase the size of small bitmaps guessing the missing pixels without interpolating pixels and blurring the images. Scale2X was originally developed to improve the quality of old Arcade and PC games with a low video resolution played with video hardware like TVs, Arcade monitors, PC monitors and LCD screens. then the filter subsamples the new pixels to a weighted average pixel. You can find this filter through Filters → Enhance → Antialias. The following examples illustrate the effect on some patterns. The small squares are one pixel in size (zoom 16:1).